The earliest Soviet designs for lunar landers were similar to those of Von Braun in the 1950's. 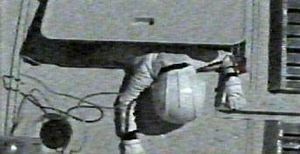 Russian manned lunar lander. Study 1958. Painting of early Soviet concept of a lunar lander. This was similar to Von Braun designs popular in the 1950's. 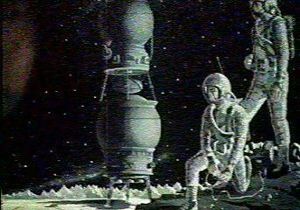 Similar designs were used in the 1957 film, Road to the Stars, for which Tikhonravov was the technical adviser. Family: Lunar Landers, Moon. Country: Russia. Agency: Korolev bureau.